On this day one hundred and twenty five years ago a fiery monk by the name of Swami Vivekananda went to the USA to spread the message of the essential divinity of man across religions as taught by the ancient scriptures of the country and the philosophy of the great saint, Ramkrishna. The story of the people breaking into a deafening applause when they were addressed as brothers and sisters at the Parliament of Religions in Chicago has more than given us a peep into the essential spirit of the sensitivity of the American people, though they have always been depicted as being too materialistic and mundane. There is no denying the fact that they have always been inclined towards a materialistic mode of life but that they are capable of the tender feelings of love and emotions and are willing to reciprocate love was proved in their reciprocal gesture. The first thing that the great Swamiji, fortified with the blessings of his master, did was to reach the hearts of the American people and set the unprecedented yet extremely humane instance of reaching out to people with the message of love. On the soil of the host country he did not lack the courage to tell them that instead of sending missionaries to his country to enlighten people about religion, it was desirable to stand by the famished people and feed them. He told them about the essential wisdom of the people of the country sustained by the religious teachings of one of the most ancient and enduring religions of the world. He sounded a warning by way of recounting the story of the frog in the well to drive home the message that one should come out of one’s restricted periphery and transcend barriers to discover the essential truth of divinity across all religions. That for the first time was dazzling the image of a monk, loved and nurtured by Lord Ramkrishna, spewing fire to burn away the impurities of ages. He was hailed in different cities and people turned out in large number to listen to him. His erudition, the style of speaking and the depth of his wisdom left a lasting impression on his audiences. He spoke at a great number of religious seminars and places and began to command a following among the educated people of the country, making many preachers from his country and the USA envious. He went ahead with his work to achieve his goal and finally came back to the motherland to do the work the master had assigned to him long ago. He injected life into the youth of the country and told them to render services to those who are destitute and oppressed. He encouraged his followers and disciples to worship God in man and serve one and all without any precondition and prejudice. One hundred and twenty five years have passed since then but we have not been able to assimilate the essence of his teaching, the core of humanity with potential for elevation to divinity, the one of unalloyed love for one another. We tend to be overassertive, belligerent, violent and avaricious, forgetting our commitment to ourselves and the miserable and destitute around us. When the environment of the world is marked by growing hostilities and religious indoctrination, the only resource that seems to be lacking is that of love. Against this murky backdrop of nations and people asserting their might that results only from hatred, it is the virtue of compassion that can effectively sustain the progress of the human civilization. Ironically the essence of all religions and scriptures teaches man to be compassionate and love one another to discover the essential entity of God in the form of pantheism. This was precisely the message that was delivered by Swami Vivekananda on this day at the world parliament of religions at Chicago one hundred and twenty five years ago. We therefore cannot miss out on the import of this profound message to rescue us from self annihilation. Instead of nursing the wounds we have inflicted on ourselves, we need to invigorate ourselves only with the feelings of altruism, compassion and love. 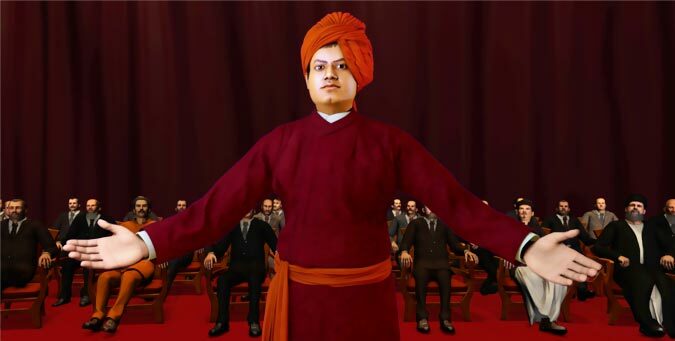 Vivekananda told us to worship God in man and when we are able to embrace it from the core of the heart, one will not hurt one’s love, one’s God.